Edward, our beloved, diminutive 13-year-old whom we call Eddie, was the first name to be called this past Saturday at the start of our annual graduation ceremony. When he heard it, he burst out of one of the Micah House bedrooms where the grads were waiting and processed down the aisle of our living room, which had been transformed into a 150-seat auditorium for the event. As Eddie marched down the aisle, the graduation guests on either side of him applauded him wildly, and a huge smile broke out on his face. What an amazing opportunity for this young man to be celebrated for such a miraculous accomplishment! Yes, Eddie was graduating from the sixth grade! Wait; what??? Micah’s staff and missionaries had just spent weeks meticulously planning for a graduation that was mainly for our four sixth graders. One hundred fifty guests, two giant cakes, elegantly-set tables for an elaborate dinner, a stringed-trio for music…isn’t that a little over-the-top? Why do we do it so big? To answer that question, we have to backtrack four years to November of 2012. Eddie is not in the Micah House; rather, he is living in a trash-strewn alleyway in Tegucigalpa’s outdoor market. He is only nine years old, and he is the youngest of the ten or twelve youth living in this dead-end place. We try to engage Eddie in conversation, but he is so high on yellow glue fumes that he can barely speak. He was born just a couple of blocks from this alleyway to a mom with some mental problems, and the streets are literally the only life he has ever known. When we visit his alley, he stumbles over to us to ask for food. That is the only thing he really dreams about: to be able to go to bed with a full stomach. He doesn’t dream of being a doctor or a pilot like other nine-year-olds. He doesn’t even dream of graduating from high school. I’m not even sure he really even knows what school is. But through the final months of 2012 and in early 2013, we begin to build a relationship of trust with him. We bring him to the Micah House for a couple of hours at a time, and, slowly, he begins to understand that there is more to life than his alley. 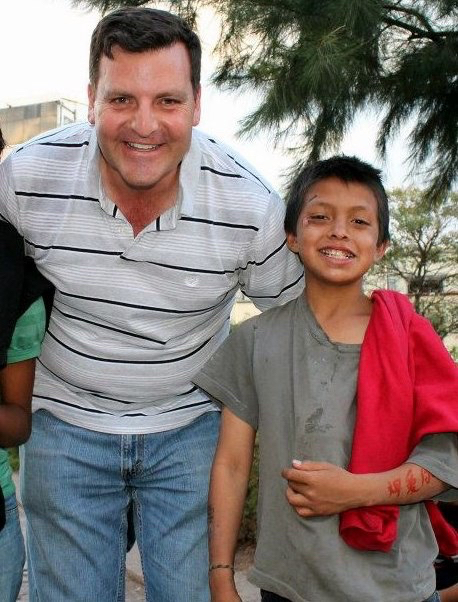 Finally, in April of 2013, he left the streets behind and joined the Micah House. Edward (right) and two of our other 6th grade graduates, Junior and Noé, spent time together on the streets before moving into the Micah House. And this little guy never looked back. He took everything that Micah offered him by the horns and didn’t let go. He may be one of our smallest guys, but he is a large presence in our home, with natural leadership skills and a huge heart. 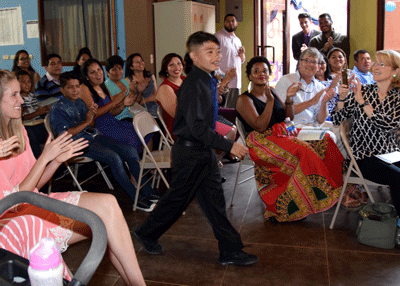 He was able to do first through sixth grade in just three years, and is revved up about starting middle school next year. So, yes. When we celebrated Eddie’s sixth grade graduation, we did it big. We didn’t just celebrate the completion of coursework. We celebrated God’s mighty handing reaching into that alleyway and plucking Eddie out of its miry pit. We celebrated the fact that this child was lost but now is found. We celebrated light bursting out from darkness, chains of addiction broken, new life resurrected from death. We celebrated the power of God’s mercy and love in Edward’s life. So, yes…we did it big! Eddie’s story is repeated with slightly different shades in the three boys that graduated sixth grade with him. Noé, who is also thirteen, had consumed yellow glue for so long that when he entered Micah in March of 2014, the first few weeks he was with us, he could barely walk without staggering. 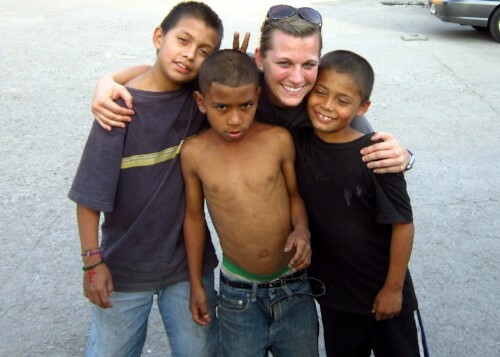 Sixteen-year-old Junior left the streets in November of 2014 after having lived on them for several years. And 15-year-old Josue, talented in so many ways, entered the Micah House this past July after having been beaten mercilessly by a gang in the market area and left for dead. Noé inhales yellow-glue while still living on the streets. We praise God he is safely off of the streets and overcoming this addiction! Josue spends some time at the Micah House while we celebrate the lives of street children--who are, unfortunately, often treated as though their lives don't matter. Today, we are so blessed to have Josue off of the streets and living at the Micah House! Michael visits Junior when he was still living on the streets. We're so thankful he now lives in the Micah House. Each one has a terrible story to tell about his past life on the streets. But on graduation day, they were not focused on the past. Each one had a big smile on his face as he was celebrated by their big, loving adopted family here at Micah. Big smiles, big family, big transformation—big God! Indeed, a very, very big day. The guys show off their unique personalities in this fun photo! We even made matching keepsakes for some of our guests.